iSuppli watches all kinds of technology markets for things running from computers and tablets to TVs and more. The company has published its latest research that looks at flat-panel TV shipments. Flat-panel TVs include LCD sets, plasma TVs, and rear projection TVs. For the first time in the history, the market research firm iSuppli is predicting shipments of flat-panel TVs will fall. Shipments are expected to decline in 2012 to 37.1 million units, which is 5% less than the 39.1 million units shipped in 2011. Interestingly, despite shipments expected to decline this year, profits in the flat-panel TV market are expected to go up. 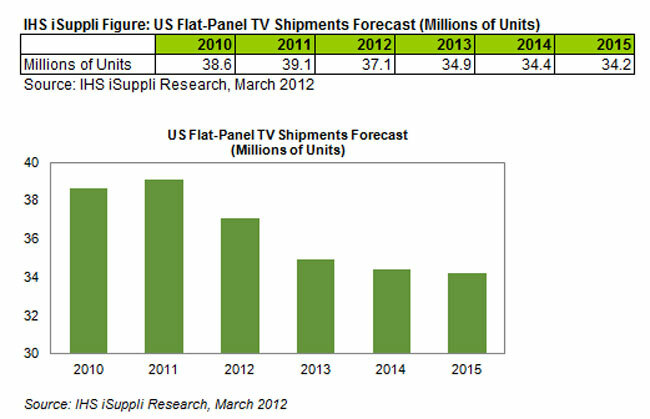 iSuppli notes that last year flat-panel TV makers overproduced TVs leading to sharp price reductions later in the year. This year, production will be more in tune with demand resulting in improved profits. Research firm expects shipments to continue to decrease for at least the next three years.